Several minor bug fixes and small cosmetic improvements to the UI. FREE FOR A VERY LIMITED TIME FROM REGULAR PRICE $4.99 US TO CELEBRATE MICHELANGELO'S 540TH BIRTHDAY!!! 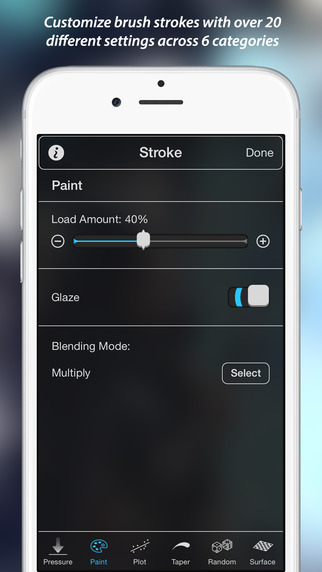 Available exclusively on the App Store, meticulously designed using the beautiful new features of iOS 8 and painstakingly engineered for the 64-bit CPU and quad-core GPU of the iPhone 6 — Inspire delivers an incredibly fast and realistic painting, drawing and sketching experience that you can take with you wherever you go and use whenever inspiration strikes. Our proprietary painting engine Sorcery™, based on OpenGL, takes full advantage of the GPU to render brush strokes with brilliant 64-bit color, laser-sharp sub-pixel precision and insanely fast speed. While the strokes of a wet oil paint brush look beautiful on their own, the breathtaking blending effects of a dry brush will absolutely stun you. Graze the canvas with a tiny bit of pressure to add a subtle blur to your artwork or use stronger pressure to actually mix existing colors on the canvas together to create new ones. With no instruction manual or handbook required, whether you are a beginner, expert or somewhere in-between, you will enjoy the simplicity and power of the most intuitive and compelling illustration app for iPhone, Inspire. Visit KiwiPixel.com to check out more screenshots, videos and artwork.